This is a quality guitar that can do much more than roots rock. Build. Weight. Classic sounds. Playability. Some may prefer a bigger neck. Price. 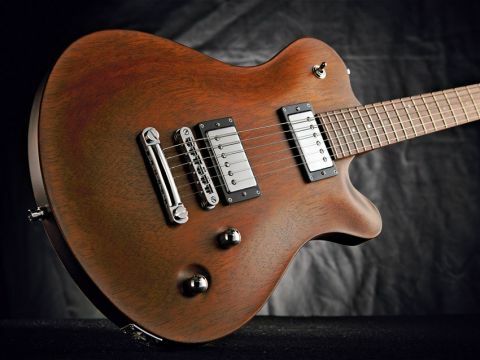 You may think the Panthera seems a bit plain, but there's great guitar craft on show here. The build quality and weight of the Framus make it very nice to play. The neck pickup can create some vocal depth for deep blues tones. The nicely offset neck heel gives easy access to the upper frets. The Framus guitar has come an awful long way since its sixties heyday. The brand, now of course made by Warwick, is completely different, centring on modern designs that are impeccably made - in small numbers - with some of the highest technology machines and fixtures used by any top maker. The Panthera range typifies both that quality and style. Our standard all-mahogany model is joined by maple-topped versions and even a seven-string, and in its very well applied satin antique tobacco oil finish here it looks extremely workmanlike, reflecting loosely its 'blue-collar' Telecaster-inspired outline. "With a dirtier amp, the Panthera turns into a taut, punchy riff machine on the JB bridge pickup." This, however, is a 628mm (24.75-inch) set-neck design; the body top is smoothly graduated and carved, the rear has a shallow rib contour and overall body depth is 44mm. A mahogany neck is neatly fitted to the body, the heel nicely shaped and offset, making top fret access easy. Modern Framus necks exude playability - the medium gauge frets are superbly polished and fettled (Framus uses the Plek set-up system). In profile we have what feels like quite a skinny, shallow 'C' (19.5mm at the first fret, 22mm thick at the 12th): if you're a fan of big necks, you won't find one here. Playability, however, is faultless as is the entire construction: beautifully detailed and up there with the absolute best. The top-drawer vibe is continued by the Tone Pros hardware, black Tusq nut, Seymour Duncan covered 'buckers, beautiful domed, knurled metal knobs matched by a chromed metal-tipped pickup selector, and included Warwick strap locks (not to mention a user kit and top quality Warwick gigbag). The jack socket is firmly mounted on a chromed metal plate - just how we like 'em; stage worthy and easy to maintain if needed - and even the cover of the rear control cavity is neat. It's a precision moulded plastic plate, with two small push clips all you need to remove it. This Panthera's rich acoustic ring underpins its clean sounds, which are perfect for chiming chord thrangs and picked arpeggios. The balanced tone - nice bass but not Les Paul huge, with punchy, very Gibson growling mids and bright but slightly rounded highs - also works very well with more effected, modulated sounds. There's plenty of woody chop to the cleaner tones; pull the volume down, engage both pickups and pull up the coil-split switch (which voices the screw coils only) and you're in Fender land. The split bridge pickup is country sharp, but with a little gain gets quite punky; the neck single-coil is sweet but articulate. There are some very good sounds here. With a dirtier amp, the Panthera turns into a taut, punchy riff machine on the JB bridge pickup, while the neck pickup is, by comparison, a little underpowered. This does create more vocal depth for bluesier outings, however. Lightweight, comfortable, responsive and a great player - this one covers a lot of ground. This is a very fine guitar, no question. Ballsy, excellent for no-nonsense classic to modern rock but also cleaner, ringier voices, older blues and jazz tones too. It's well balanced, lightweight, resonant and, we'll say it again, absolutely beautifully made. Our dilemma is simply the price, not helped by the current euro to pound exchange rate. On paper it appears steep for what many will see as a Plain Jane 'utility' guitar that's pitched against some of the world's finest and most established brands. In reality, compared to other high-end brands it's not silly and, if you simply appreciate great guitar craft, you should really investigate what Framus is creating. What's that saying? Buy well, buy once?